Although I do remember watching The Muppets growing up in the ’80s, I only recently realized how amazing these characters are during a Disney press trip last year when I walked the Muppets Most Wanted Red Carpet Premiere at El Capitan Theatre. I was able to meet Miss Piggy and Kermit the Frog as well as interview the filmmakers. They truly are incredible! So, I was very excited when I found out we would get to visit the set of The Muppets on ABC and “Up Late with Miss Piggy”. During our visit we watched a preview screening of an upcoming episode of The Muppets on the set of “Up Late with Miss Piggy”. Afterwards we had a Q&A session with Executive Producer and Actor (“Pepe,” “Dr. Teeth,” “Rowlf,” “Bobo the Bear,” “Swedish Chef,” etc.) Bill Barretta and Executive Producer and Director Randall Einhorn. But first we had to make a stop at The Muppets “Up Late with Miss Piggy” mural on the Walt Disney Studios lot for a group photo! It’s interesting that Randall Einhorn and Bill Barretta are both Executive Producers on the show because they can have very different ideas. They eventually combine their ideas to create the story lines and they tend to work together more at the production stage. Randall said that Bill is the Muppet Captain because he’s also a performer and he’s logistically out doing it. Bill actually began performing with The Jim Henson Company in 1991 and quickly became one of the core Muppet performers. He developed several characters on the ABC series Muppets Tonight, including Pepé the King Prawn, Johnny Fiama and Bobo the Bear to name a few. Barretta also inherited several of Jim Henson‘s characters, including Rowlf the Dog, The Swedish Chef and Dr. Teeth. He has been a big part of several different Muppet projects, including Muppets Most Wanted. Randall brings more of a documentary style to The Muppets they are not used to. He has more of a raw vision as a Director of how the pieces are ultimately going to come together. Randall was actually “The Documentarian” on The Office, one of my favorite TV shows. He became the most prolific director of the show, The Office,, during its Emmy-award winning seasons. He has also worked on shows such as Parks & Recreations, Modern Family, and Shameless. The two Executive Producers get along incredibly well and by speaking to them you can tell they have the utmost respect for one another. They two say the Muppets have always been about making ourselves laugh. It was never geared towards any one group, whether it be adults or children. Our grandparents can even remember further back like Rowlf on the Jimmy Dean Show. Not all little kids will get the jokes in The Muppets because those are for us adults to enjoy. Randall said but hopefully years later when these kids grow up they will go Oh My Gosh, I didn’t know that’s what they meant. The Muppets are puppets and there are many different types. Kermit the Frog, for example, is a very malleable puppet. If you look closely, you can almost see the knuckles of Steve Whitmire’s hand creating the facial manipulations. Kermit also has arm rods on the wrists which makes him a Rod Puppet. Where puppets can get much more difficult is when they are operated by more than one person. Fozzie is operated by two people. One person works the head, behavior and body of the Character. Bill showed us how to operate the puppets with his hands. Puppeteers must collaborate often because different Characters operate in different ways. Most of the Characters are performed by 6 people! Yes, 6! For example, in a scene with Pet Bey and Swedish Chef they use someone such as Peter Lintz (creator of Walter) who is very familiar with the Characters. They will then go back and do the dialogue, the voice of the Character, later. It can be very time consuming especially when two Characters in the same scene are performed by the same Puppeteer. To really get great performances from both that feel authentic and true to those Characters, Randall takes into consideration the time. A Puppeteer, such as Eric Jacobson, can start with Miss Piggy while they have somebody else standing in for Foz. Then they have to shoot the other side. Eric will get out of Miss Piggy and go into Fozzie. Very time consuming for sure! Randall said he got to operate one of the puppets once and by the time he was done he was sweating. It is very hard work. From a Director’s standpoint, they prep an episode for 5 days and shoot for 6 days. They may do four 10 hour days, two 12 hour days and two 14 hour days depending on if they go on location. It can take a lot of time because they need monitors and the floor removed for operating the Characters. They use television monitors so they can see exactly what the camera sees. It is the only way they are able to see the Characters. They place the monitors in very specific places depending on what they are doing or the action in the scene. Randall said a normal comedy or drama TV show takes at least 15 minutes to rehearse a scene, 45 minutes to light the scene and do camera rehearsals. The Muppets takes double the time. If they have 28 scenes then that’s 56 hours of not shooting! The Performers and Bill Barretta created a Character Bible. It gave those who didn’t have a good sense of the Characters some background, history and places the Characters might go. Gonzo is not the same guy he was 30 years ago. The Performers, people and relationships have evolved. Walter quickly became a favorite character from Muppets Most Wanted. We haven’t seen him in The Muppets show… yet. Bill said Walter just doesn’t have a place yet on the show. So, why the late night talk show? 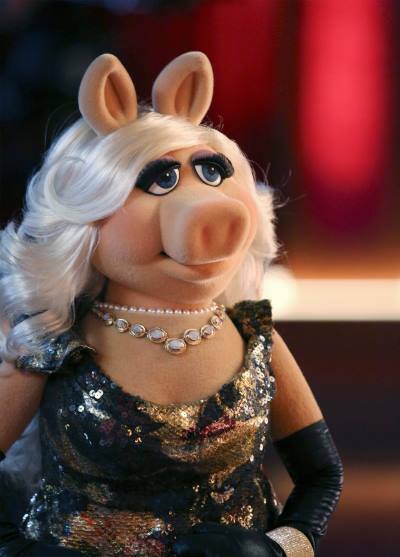 The writing staff really wanted Kermit to have a normal life – a real job, a mortgage… A talk show places the Characters in the real world where Miss Piggy plays a celebrity who has a talk show. She’s just like Ellen Degeneres… but with a whole lot of sass! Piggy is such a diva! Piggy likes to make everything about her. The talk show definitely helps her with that. She welcomes celebrity guest stars on each show such as Elizabeth Banks, Reese Witherspoon, Josh Groban, Imagine Dragons, Liam Hemsworth, Topher Grace and Chelsea Handler. Randall and Bill said they call the guest stars to get them on the show, such as Mindy Kaling. On tonight’s episode Dave Grohl battles Animal in a drum-off! DAVE GROHL, FLOYD PEPPER, JANICE, ZOOT, DR. TEETH. Of course, both Executive Producers had their dream list of guest stars. Randall hoped for Ringo or a repeat of Jeffrey Tambor. Bill quickly said Jimmy Stewart. He also said Pepe would love to work with Sophia Vergara. We were curious to know if the Executive Producers thought about updating any of the past greats like Phenomenon with Sandra Bullock. They are talking about maybe bringing some of the old acts back a little bit on the show, maybe. Of course, they don’t want to give too much away! Watch tonight’s episode (12/1) as the Great Gonzo returns to perform a high-flying stunt! 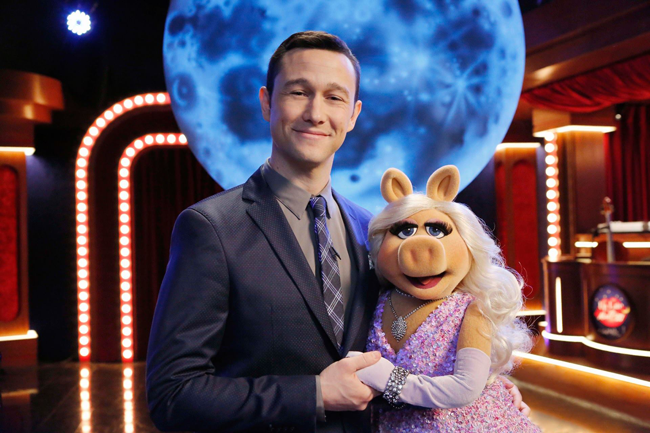 Joseph Gordon-Levitt returns after a show-stopping duet with Miss Piggy on “Up Late with Miss Piggy.” Tonight he’ll join Scooter, Pepe and the gang for poker night. You’ll also see The Great Gonzo perform his dream stunt and Dave Grohl challenges Animal to a drum-off! The Muppets is co-created and executive-produced by Bill Prady (“The Big Bang Theory”) and Bob Kushell (“3rd Rock From the Sun”). Kristin Newman (“Galavant”), Randall Einhorn (“The Office”), Bill Barretta (“Muppets Most Wanted”), Debbie McClellan (The Muppets Studio) and Kyle Laughlin (The Muppets Studio) are also executive producers. The Muppets is produced by ABC Studios and The Muppets Studio. Do you watch the new tv show? I know she/they are “only” puppets but that doesn’t mean they are not real! No matter your age, you can learn from the Muppets. I don’t have TV so I don’t get to see them often.